Does My Dog Need a Flu Shot? Flu season is around the corner, which means it is time to begin taking preventative measures against infectious disease. Millions of humans this year will receive a flu shot. Should your dog be vaccinated against the flu as well? Here, everything a pet owner should know about H3N8 canine influenza virus will be discussed, as well as the options for prevention. What are H3N8 and H3N2 CIV? In 2004 researchers identified a previously unknown virus in a population of racing Greyhounds. The virus, which was named the H3N8 canine influenza virus (CIV), had adapted from a horse-specific flu strain a canine-specific strain. Prior to 2004, dogs were not believed to be able to catch any form of the flu. Since then, H3N8 CIV has been identified in at least 38 states across America. The dog flu is highly contagious and can quickly spread among densely packed dog populations, such as in boarding kennels. In 2015, H3N2 was identified in dogs for the first time in the United States. Previously, this disease strain had only been seen in Asia. How Can I Tell if My Dog has the Canine Flu? Dogs infected with H3N8 or H3N2 show symptoms that are common with upper respiratory infections. The most common symptoms are coughing, sneezing, eye or nasal discharge, and a low-grade fever. Dogs with the flu may also be lethargic and have a decreased appetite. If your dog is showing these symptoms you should schedule a visit to your veterinarian. There, the vet will perform a nasal or throat swab and confirm the results with a blood test. Is the Dog Flu Dangerous? The dog flu by itself is not fatal. However, the flu weakens the dog’s immune system and leaves it susceptible to developing a secondary bacterial infection. Dogs harbor countless bacteria in their bodies, therefore the risk of secondary infection is high. Ultimately, dogs that do die from the flu typically do so because of bronchitis, pneumonia, or another bacterial infection. Additionally, dogs have no natural defenses in their bodies against the flu. Consequently, every vaccinated dog that is exposed to the virus will become a disease carrier, and 80% will show clinical symptoms. The virus is resilient and can live for up to 48 hours on surfaces, such as food and water bowls, making the possibility of mass infection likely. Humans can also carry the disease on their bodies for up to 12 hours, making it possible for them to spread the virus among dogs. Should I Vaccinate my Dog Against the Canine Flu? Multiple vaccines have been designed to prevent dogs from spreading the influenza viruses, including vaccines that protect against both flu strains. 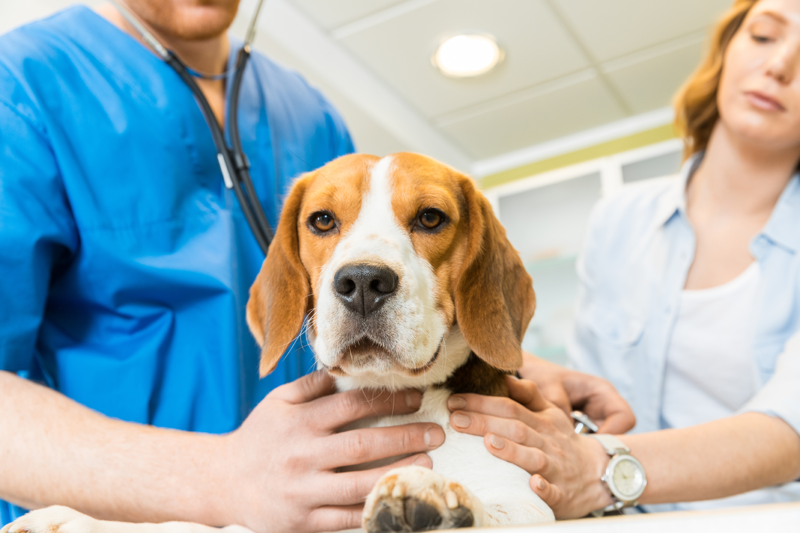 Research has indicated that the canine flu vaccines reduce the likelihood of contracting H3N8 or H3N2 and can decrease the severity of symptoms should infection still occur. Not all dogs need to be vaccinated against CIV. However, dogs that are commonly around other animals such as in boarding kennels, daycare facilities, and dog parks should be vaccinated. 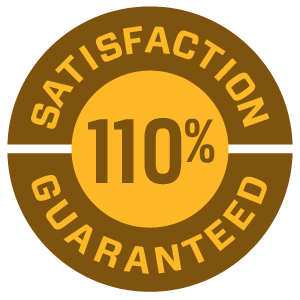 Dogs that are vaccinated against kennel cough are good candidates for receiving the CIV vaccine. Are there Side Effects to the CIV Vaccine? As with any vaccine, there is a possibility of side effects. 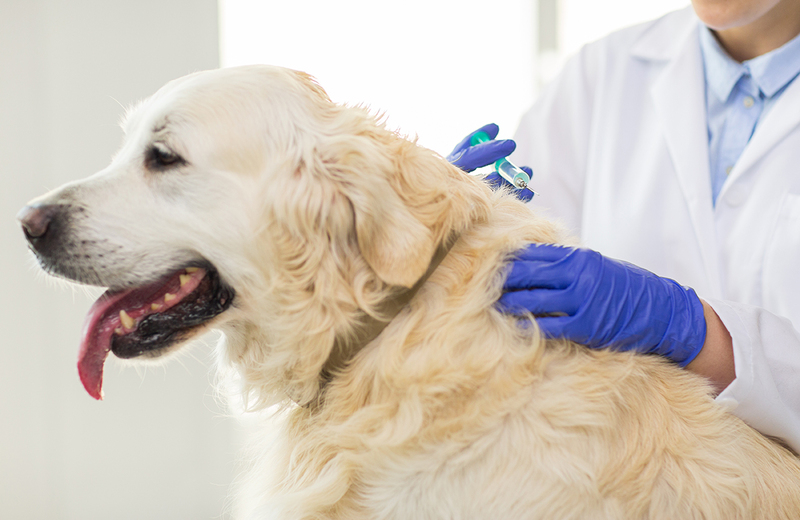 Adverse reactions to the canine flu vaccine are mild and rare. These include lethargy, vomiting, diarrhea, injection site pain, swelling, and anaphylaxis. If your dog has ever had a vaccine reaction in the past, talk to your veterinarian about the risks involved. What Else Can I Do to Protect my Dog from Infectious Disease? Besides vaccination there are steps that dog owners can take at home to support a healthy immune system and prevent disease. A healthy diet full of antioxidants is important for a fully functioning immune system. Regular exercise will not only support your dog’s immune system but will also keep your dog at a healthy weight. Obesity is a leading risk factor in disease and compromised immune function. Immune-boosting supplementation is also important, especially in dogs that have a compromised immune system or are prone to chronic disease. Research has shown that the immune system is strongly influenced by gut health. 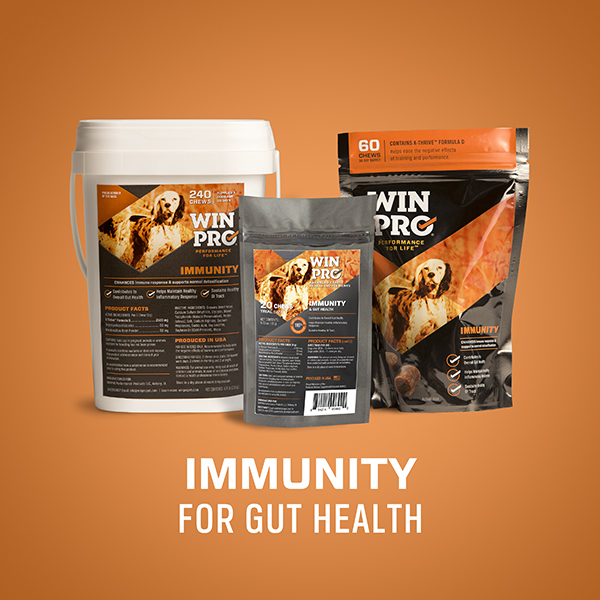 WINPRO Immunity fights inflammation with K-THRIVE animal blood proteins while supporting immune health. Ultimately, the canine influenza viruses represent a new class of infectious disease that can quickly spread and infect large populations of dogs. While the flu itself is not deadly, secondary infection can be devastating. Vaccinating high-risk dogs and providing supportive immune system care can reduce your dog’s risk of disease.